Ford Racing 2 is the latest game from developers Empire Interactive that once again throws gamers behind the wheel of a variety of Ford cars. 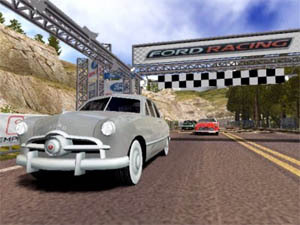 As with the previous version, the game also features a plethora of Ford cars that dates back from 1949 to the current models of today and even the futuristic concept cars. 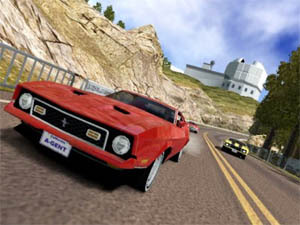 The premise behind Ford Racing 2 is a good old fashioned racing game that contains a variety of different gaming modes and some beautifully designed gaming environments that include speedways, ghost towns, the golden gate bridge and even military bases to help keep ones interest in the title. The game also boasts over 32 accurately portrayed real-world cars that unfortunately are all American designed cars that range from Mustangs and Thunderbirds, it would of been nice if there were some Australian models included too. The modes play for Ford Racing 2 contain over 8 different gaming modes that include standard race, duel, drafting, race line, time trials and even elimination modes. There are also some secrets in the game that must be unlocked while you are playing the title that gives you access to more tracks, different game modes and of course more Ford cars. 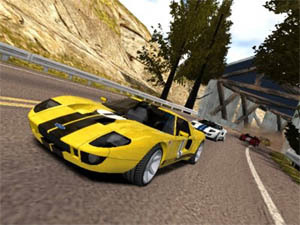 Clearly Ford Racing 2 is above many of the other car games on the market at the moment with its vast range of different gameplay modes and themes. 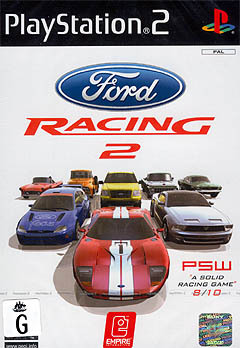 Although Ford Racing 2 doesn�t support the PS2 Online, it does support a multiplayer mode that allows you to race against friends via split screen races. The control system of Ford Racing 2 is perfect and uses a combination of the analog stick to control you car with the X button used to accelerate and the O button used to brake and reverse. Empire Interactive have also gone to extreme lengths to ensure that each car handles differently on the track and whether you are playing the 1956 F-100 pickup or the new millennium super-car Ford GT, each car is guaranteed to have its strengths and weaknesses. The game also supports a changeable difficulty level that allows both novice and professional gamers to easily start playing this addictive title. There are also two racing views that include bumper cam and rear cam but most gamers will probably use the bumper cam because it truly gives you a sense of speed. Graphically, Ford Racing 2 is a spectacular game and my hat goes off for Empire Interactive for such an attractive looking title. The cars are extremely well modelled and contain some beautiful texture details that almost make you think you are watching TV while you are playing this game. The backgrounds have been extremely well designed and look graphically pleasing with a variety of moving objects to ensure that the racing remains dynamic. There are also some great lighting effects from shadows to extremely realistic reflective surfaces to give the game that real-world feel. Another impressive feature to the game is that the frame rate remains constant and there was no slowdown whatsoever. A nice little touch that the developers have done is that each speedometer is different, so if you are driving the 1968 Mustang GT or the Ford Focus, it helps portray the era that the car is from. The sound effects behind Ford Racing 2 are spectacular and each engine has been digitally enhanced for the PlayStation 2 that sounds simply phenomenal through my home entertainment setup because of the native Dolby Surround Pro Logic II support that this game contains. Apart from the realistic engine noises, there are also a variety of other effects such as the screech of tyres going around corners at unbelievable speeds, the sounds of cars colliding at high speed and a variety of other racing sound effects. The soundtrack of Ford Racing 2 has a variety of different musical genres that helps immerse gamers into the world of Ford racing. Ford Racing 2 is a great title that I�m sure all Ford and racing fans will get something out of this game. With amazing graphics, highly detailed gaming environments and a very stable control system, this game has it all. The unfortunate thing about Ford Racing 2 is that it may scare some gamers away because it is limited to the Ford Motor Company but if you are looking for an addictive title till Gran Turismo 4, than this is the one. Check it out!